Donna Hauser is a Research Associate at the Polar Science Center working with Kristin Laidre and Harry Stern. She is a marine biologist whose research is centered on understanding the ecological implications of environmental change. Some of the most profound physical changes on earth are occurring in Arctic marine ecosystems, where she examines responses in marine predator movement and behavior. Understanding animal movement across multiple scales is a unifying theme of Donna’s research, allowing her to engage in applied research at the intersections of marine biology, oceanography, and fisheries. Donna’s research interests in marine and freshwater ecosystems were spurred by a childhood spent exploring southcentral Alaska and launched by a formal education from the University of Washington (UW). At the Polar Science Center, she studies the related issues of recent and future sea ice loss, marine mammal responses, and shifting habitat for these ‘sentinel’ species in an increasingly navigable Arctic. More information about Donna’s research and publications is available on her website: https://donnahauser.wordpress.com/. The Alaska Dispatch News reports on the study published in Global Change Biology of beluga whale migration patterns influenced by changes of the annual Arctic freeze-up. PSC authors include Donna Hauser, Kristin Laidre, and Harry Stern. The article also makes a parallel comparison to a study of ice retreat, published in JGR Oceans, co-authored by PSC’s Rebecca Woodgate. The University of Washington news produced a video with the Polar Science Center highlighting a six-year study of Beluga whale populations. Donna Hauser, Kristin Laidre, and Harry Stern participated from PSC. Eurasia Review reports on the results of the lengthy study of beluga whale migration led by PSC and published in the journal Global Change Biology. The news post includes previous comments by some of the authors, Donna Hauser and Kate Stafford. The news source International Business Times, out of the UK, reports on findings recently published in Global Change Biology of a decades-long research study involving Beluga whales. Donna Hauser, Kristin Laidre, Harry Stern and colleagues examined changes in autumn migration timing of Beluga whale populations since the 1990s. Science Daily, the popular science news website, posts coverage of the recently published study of the annual migration of some beluga whales altered by sea ice changes in the Arctic. The study and findings were published in Global Change Biology, authored by Donna Hauser, Kristin Laidre, Harry Stern and Kate Stafford, among others. 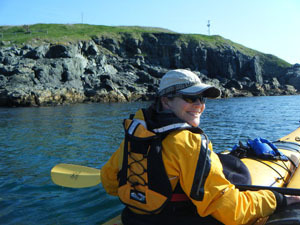 Donna Hauser participated in the analysis of beluga whales in the western Beaufort Sea. Temporally and spatially diverse data sets which included aerial survey, passive acoustic, and satellite tracking data were synthesized to gain baseline information and a more holistic understanding of beluga distribution. Read about the project published in Deep Sea Research. Kristin Laidre led a research team that investigated the importance of glacial habitats using telemetry data from Narwhals which were captured and instrumented with satellite-linked time–depth–temperature recorders in Melville Bay, West Greenland, over numerous years. Read about the findings in Biology Letters.